It's recruiting developers, producers, artists and more. Update: Lucasfilm Games has provided some clarification in regards to its role at Disney and relationship with third party publishers and developers. It was actually brought back around the time as LucasArts closed its doors, several years ago, specifically to work with studios and the Star Wars brand, not to develop games internally. Disney and Lucasfilm Games are still committed to its partnership with developers and publishers like EA, a representative said, and there are no plans to change this. The recent job listings, as noted in the original story, are all focused on supporting live and upcoming Star Wars games. Update: While the Disney Careers listings are all publisher-side jobs, it looks like Lucasfilm Games has also been looking for designers as far back as 2017. Disney was advertising for a technical artist, engineering manager, producer, community manager and a lead game designer on Linkedin, a screencap of which was shared by Team17 community manager Ashley Day, suggesting that new games, at least then, were being considered. Original story: Disney appears to have resurrected Lucasfilm Games. You'll probably be more familiar with its successor, the greatly missed LucasArts, which developed and published countless games both in and outside the Star Wars universe until it was closed in 2013. While LucasArts was responsible for everything from Monkey Island, as a developer, to Knights of the Old Republic, as a publisher, don't get your hopes up about a wave of new games appearing. Job listings posted on the Disney Careers website suggests that it will support games using Lucasfilm IPs, including Star Wars, rather than developing them itself. None of the listings are for developers or game artists; they're for roles like producer, associate brand art director and marketing coordinator. The listings mention helping "build the next great set of Star Wars and Lucasfilm heritage products" with developers and "managing the review and approval of interactive products that incorporate Lucasfilm IP, such as Star Wars film and television properties". While some might wish Disney would take away the licence from EA, which has just produced only two Star Wars games, both sequels, in six years, there's nothing to suggest that will happen. But with the cancellations and the issues caused by Star Wars Battlefront 2's business model, it may be that Disney has decided to become a little bit more hands-on. 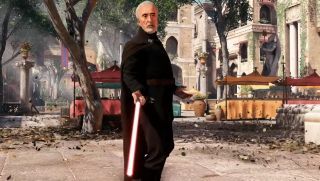 It could also be interested in remastering or bringing back classic Star Wars games. "Heritage products" suggests that's a possibility, and there's certainly an appetite for it, judging by the reception to fan remakes of Dark Forces and Star Wars Episode I: Racer. Hopefully Disney increasing its investment in games will also result in developers getting the extra support they need to get those games out. While only two have actually appeared in recent years, more have been in development and then subsequently shelved. Loads of talented people have worked on Star Wars games over the last decade; we just haven't seen much of what they created. The next Star Wars game on our radar is still something of a mystery, but a proper reveal is coming in April. In the meantime, here's everything we know about Star Wars Jedi: Fallen Order. And if you're in the mood for some nostalgia, give our secret history of LucasArts a read.